I shared A Haunted Halloween mantle with you last week then I remembered I had some really cool lights purchased last Christmas season from AKA Stella Gray on Magazine Street. The LED lights appear on a thin strand of copper wire, and I think the lights add just the right touch to the mantle vignette. I really like the way it lights it up at night. Hey, Mr. Blue Eyes! How are you? 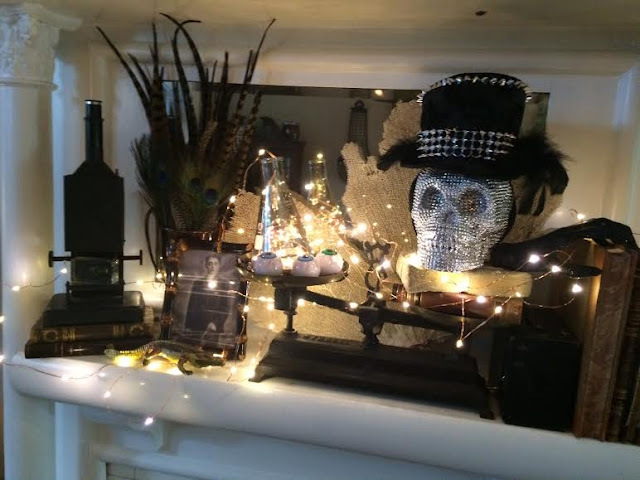 Oh, your mantel is something else! I think I'm seeing a wonderful scale with the eyeballs and the skull on it! The lights really make it look scary! ;) Hope you're doing well. Loooooove those lights! I hate how the strand is so obvious on regular light strands, and I've always thought they should do something more discreet! Score for finding those! Looking very spooky around your house.....love the addition of the lights!